Swans Landing is an eight mile island near the southern end of the Outer Banks, which is the chain of islands that separate North Carolina’s mainland from the Atlantic Ocean. It is accessible only by ferry, which runs a few times a day, or by private boat. The village–where the couple hundred residents live and work–is located near the northern end of the island. The ferry dock and the lighthouse are also located on this end, though the ferry dock is on the sound side and the lighthouse is on the ocean side. The rest of the island toward the south is protected National Seashore land and is mostly covered by a maritime forest of short, gnarled trees, as well as marsh areas. In reality, Swans Landing doesn’t exist. It is a fictional island, created in my head to house the people in my story. But the basis for the island does come from real places. 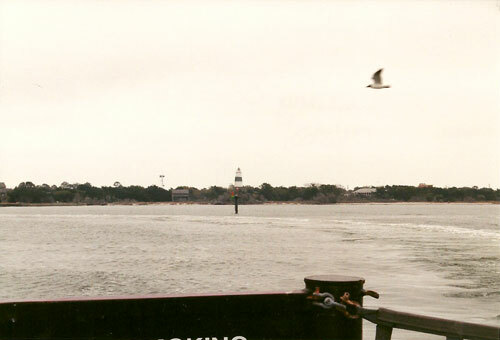 Swans Landing was mostly inspired by the island of Ocracoke, which is the southernmost inhabited island in the Outer Banks. In my story, Swans Landing would sit south of Ocracoke. Like my island, Ocracoke is accessible only by ferry or private boat (also small planes, but Swans Landing doesn’t have that option since they don’t have an airport). Ocracoke also has no chain stores and no huge condos overtaking the waterfront. It’s a small, quiet island with a few hundred year-round residents. The Husband and I took a trip to the Outer Banks in early March one year, before tourist season, and I fell in love with how simple and quiet it was at that time. It’s the perfect place for a group of non-human people to live without being discovered by the rest of the world. While writing Surfacing, Swans Landing developed into a character of its own. In the story, it’s February and there are no tourists. There is only one way on or off the island, and it’s so far from the other attractions such as the Cape Hatteras Lighthouse and the Wright Brothers Memorial that even during summer it doesn’t get as much tourism as the rest of the Outer Banks. It’s more of a place where people go to be forgotten, and that’s what I wanted to portray in Surfacing. It’s a lonely place, where secrets taint everything. In a village this small, no one forgets the things you’ve done and you can’t disappear into the crowd. It’s a completely different world from what Mara is used to and she’s forced to deal with some things that she always pushed aside. When I was naming Surfacing, I had originally considered the title A Thousand Miles From Anywhere. That was the idea I had for the setting: isolated, lonely, an edge of the world feeling, like there’s no escape and no one else anywhere for miles. That title is kind of long though, so in the end I went with something much shorter, but which also could have several meanings in relation to the story. I took inspiration from the island name from two towns along the coast of North Carolina: Swansboro and Swan Quarter. I’ve always liked those names and thought that they sounded like picturesque little towns just from the names alone. That was another thing I wanted to create in the reader’s mind: a seemingly picturesque fishing village, which may not be as peaceful as it appears. There are two terms used in the book, Swanser and Woodser. Woodser is actually an Ocracoke term. I discovered this during my research on Ocracoke while writing the book. Ocockers (a term for residents of Ocracoke) refer to anyone not from the island as a Woodser. I don’t think anyone really knows where the terms originally came from or when they started, only that they’ve been passed down over the years. I borrowed the term for my book (hopefully they won’t mind!) with the reasoning that since Ocracoke is the nearest inhabited location to Swans Landing, it would make sense that they might share some phrases in their language. Maybe some of the earliest settlers of Ocracoke went on to help settle in Swans Landing and brought along their traditions. “Swansers” is then the term the residents of Swans Landing use to describe themselves. Swanser life revolves around the water. It’s on all sides of them, so there’s no escaping it. Many residents are fishermen of some sort, or else they run businesses that cater to the tourists that do visit the island, such as souvenir shops or surfing/waterski lessons. What are finfolk? Well, if you ask you’re not likely to get an answer from anyone on the island.